ATTENTION: UPDATE FEBRUARY 22, 2019 WE ARE STILL IN THE PROCESS OF GETTING OUR REPACK FACILITY UP AND RUNNING. WE DO NOT HAVE A DATE YET, BUT ARE HOPING TO BE COMPLETED SOON. WE APOLOGIZE FOR THE INCONVENIENCE AND THANK YOU ALL FOR YOUR PATIENCE! WE WILL UPDATE THIS NOTICE, AS WELL AS EMAIL ALL OF OUR CURRENT CUSTOMERS AS SOON AS WE ARE NEARING COMPLETION AND GETTING READY TO GET STARTED ONCE AGAIN. FOR NEW AND FUTURE CUSTOMERS, PLEASE CHECK BACK SOON FOR UPDATES. MAHALO, OHANA BANANA FARM, INC If you have any questions or concerns, please contact us. What is a Hawaiian Candy Apple Banana? A Candy Apple Banana is a nutritious, tasty and sweet banana grown right here on the lovely Big Island of Hawaii. 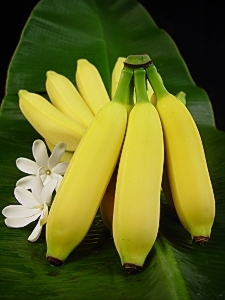 It is low in calories, hight in potassium, a good source of Vitamin B6 and fiber. Candy Apple Bananas are naturally sweet with sucrose, fructose and glucose and have 3 times more Vitamin C and 1-1/2 times more Vitamin A than your regular banana varieties. Great for snacking and a favorite with keiki (children) they’re a sweet and healthy treat any time! Our bananas are shipped via FedEx 2 day Express Service, and is included in the price of your fruit. Fresh banana orders are 2lbs, 12ozs, equivalent to 10-12 bananas, depending on weight/size of bananas. WE SHIP FRESH BANANA ORDERS AND FRESH BANANA/DRIED BANANA COMBOS THE FIRST TUESDAY OF EVERY MONTH. If signing up for our monthly membership, please keep in mind the shipping schedule and what day the 1st Tuesday falls on. PLEASE SUBSCRIBE BETWEEN THE 1ST AND THE 25th OF EACH MONTH to insure that your order is processed in time to ship on the first Tuesday of each month. All fruit is treated with SureBeam electronic pasteurization (irradiated by electron beam source) to meet federal export regulations and to ensure purity. See our page "Why We Treat Fruit For Export" and our FAQ page for further information on this post harvest treatment, required by the USDA and APHIS. Copyright © 2019 Ohana Banana Farm, Inc..